In the Sibillini unrepeatable products are created. We’ll talk about 8 specialities to discover while walking through these mountains. The lands of Sibilla are surrounded by mysterious charm since Roman times: here time seems to run slower than the hectic rhythms of the city. The caves and inlets of these mountains have been a safe haven for all those who, over the centuries, wanted to get away from the changes in history. Hence the Sibillini territory has an ability to preserve the traces of the past intact. This happens above all to the enogastronomic and cultural traditions, which in these mountains find their roots and the way of being passed down from generation to generation. Today we will tell you about 8 products that were born in the Sibillini. You can taste their most authentic flavours only here while venturing among the savage “blue mountains”. The king of meat of the Sibillini Mountains is undoubtedly the Ciauscolo IGP (PGI Ciauscolo salame). When it gets cold, the best meat is used to get the best product and to be on the right “track”: one of the finest pieces of the mentioned processing is this famous soft salami. In addition to the most tasty parts of pork, such as loin, shoulder and bacon, the mixture of red wine, garlic and wild fennel, a herb that gives the right degree of aroma and freshness to salami, are added. Ciauscolo is light pink, finely ground and… so soft that it can be spread on a slice of bread! If you are looking for stronger flavours we recommend trying liver ciauscolo, made from pork liver, flavoured with orange and nutmeg. A product almost unobtainable in the other areas of Marche and Umbria! Walking through the small villages of the Sibillini you can still find an odd bakery that produces corn bread: it is a yellow loaf, pleasantly fragrant to the touch and with a smell similar to that of polenta. The women of Amandola, an area where this preparation has stood the test of time, remember that until the early 1940s bread was exclusively mixed with corn flour and, before baking it, it was placed on cabbage leaves to avoid it sticking to the bottom. Speaking of the Sibillini means talking about sheep and their shepherds who follow them on their transhumance route. While grazing on the country herbs, sheep produce milk that is used in the historic production of raw milk Pecorino cheese. This cheese is half-cooked and naturally aged. It can be consumed after 60 days of maturing or later. During the aging period pecorino gets a strong smell that reminds you of mushrooms and truffles. It is covered with a golden and scaly crust. 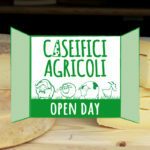 The peculiarities of raw milk pecorino cheese are today protected by Slow Food movement, which decided to form a presidium that is trying to support the shepherds who still breed the Sopravvissana sheep and use the original processing. An element that you can not miss on the “marchigiane” tables set for Easter breakfast is the Easter Cheese Bread. The inhabitants of these areas know it well and know that it is not a real “bread”, but almost a cheese panettone cake, often enriched with string pecorino cheese nuggets. This cheese bread of the Sibillini (also common in Valnerina and the surrounding areas) can be enjoyed on its own or accompanied with local cured meat such as salame and lonza. In these biscuits the taste of pecorino cheese meets sugar, flour and lemon. The cacioni biscuits, also called calciuni or caciuni, caciù or piconi depending on the area of the Sibillini they are located in, take their name from cheese, the main ingredient in the recipe. Their taste is really particular and unusual but not at all unpleasant on the palate. The shape is like a basket or a spring flower on the verge of blossoming. You can find more of them during the Easter period because they are made from the first finished cheese of the season. The pink apple is fruit always cultivated in certain areas of Marche, in a cool climate like that of the Sibillini and in any case between 450 and 900 meters above sea level. These apples are small and pink with a flattened shape. For non-connoisseurs they may seem uninviting because of their appearance: that is why it is also difficult for them to find their way to be sold on the market! The cultivation of this variety was about to be abandoned until la Comunità Montana dei Sibillini (the Mountain Community of the Sibillini) decided to preserve and protect it, managing to have the pink apple recognised by the Slow Food Presidium (we talked about it in the recipe provided!). 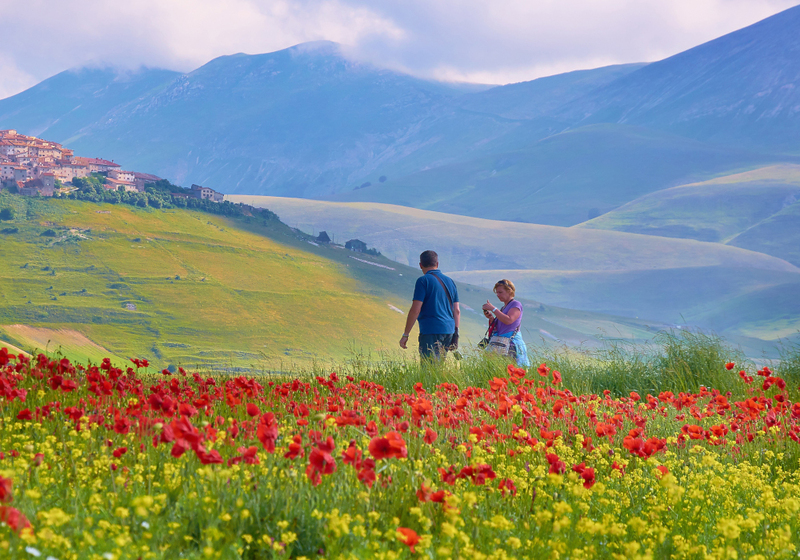 Cereals have always been cultivated in the highlands of the Sibillini: perhaps the most famous variety is the lentil of Castelluccio di Norcia, which boasts a history as old as the village in which it grows prosperously. The flower of lentil blossoms between June and July, transforming the plateau into a palette of colours, admired and photographed by many tourists! Compared to the classic lentils, those of Castelluccio are equipped with a skin so thin that they do not need soaking before cooking, which in turn makes preparation time shorter. Noteworthy are also the nutritional properties, excellent for a diet rich in fibre, proteins and vitamins. Finally … maybe not everyone knows that in the Sibillini Mountains saffron is produced. It is our red gold! In the mountains, the flowers of the Crocus sativus are picked at the end of October, strictly by hand and during the early hours of the morning so that light and heat do not alter the characteristics of the product. We then move on to the division of the flowers from their stigmas. Then they are dried at temperatures that are not too high (40 °C) and ready to be used as a spice for risottos and other delicacies.